To me, the bigger question isn't "why would one automatically presume that Pittsburgh wouldn't be involved in such a thing," but, "why wouldn't someone have heard about a fairly major event until the morning of?" I'm pretty sure the answer has to do with closed loops. Because Holly and Mandy travel in a slightly different social media crowd than I (and the rest of the PodCamp Pittsburgh organizers) do, each group doesn't always hear about the events that the other group is involved with. That's because all the chatter about these events tends to be confined to our existing Twitter / blog / podcast / social network loops -- which means we'll talk about them endlessly to ourselves, but the information will be lost to anyone who isn't already tracking those channels. The long-standing knock on social media is that we're a giant fishbowl of geeks who talk endlessly about ourselves to each other. Based upon the disconnected subdivisions I'm discovering among the Pittsburgh social media crowd, I think it's likely that every city has its own disparate groups who are caught in their own feedback loops, which means we're actually all a bunch of even SMALLER fishbowls stacked inside the same dunk tank. So how do we break out? Sure, we're all swimming in our own fishbowls, but SO IS EVERYONE ELSE. And for every person who knows what Twitter is, there are a thousand (at least) who don't, which means THOSE people are getting their information from other sources. And guess what: they don't think they're missing anything, because if something's important enough, they presume it's already found a way onto their radar. So get on their radar. To do this, you'll have to step outside your comfort zone and step into theirs. Everyone has a different information-gathering routine, and you need to figure out what everyone else is doing when they're NOT engaging you (because, right now, they aren't -- so spending more time getting the word out through your existing channels is just polishing the same fishbowl). You may have to traffic your message in unfamiliar territory. You may have to explain things that you currently take for granted. You may even have to engage different TYPES of media, because not everyone is on Twitter, or Facebook, or even the internet. But they're all somewhere, and they're all reading something, or watching something, or listening to something else. And that something probably isn't you. Yeah, this is true. I had heard of Twestival, sporadically... Except there was nothing about it that indicated to me that it was anything other than a large-scale "TweetUp". I've been to lots of TweetUps before, so I figured "ok... A lot of people are doing a tweetup on the same day. Fine". It wasn't until the day before that I actually looked at the website, and that was ONLY because it was brought up to me at the NNN party and I had told Paul Dateh about it, so I wanted to take a look at the event I had told him about. At least the NYC version had parties and donations and VIP sections... I was like ????? So I was completely unprepared for it, even though I had heard of it before. I think part of the issue is that there are so many things that are based on twitter at this point that none of them are distinguishable as special. You figure it's going to be more of the same, so you don't pay any extra attention to it. I agree- and when you find a link to a new fishbowl, you can be surprised who interesting this new crowd is, and how much they have in common with your old one as well. It's only by trying out these new bowls from time to time that we can really expand our horizons, our networks and our opportunities. You might swim in a fish bowl. I'll swim in a swim poool -- if not the river. And, as for crossing genes, Happy 200th Birthday to Darwin, yesterday. Sorry I missed the confab. Had school meeting to crash. Good idea, to expand social circles! It's part of being a well-rounded person. I also want to note that I find traditional social networking just as, or more, useful for meeting people and making business contacts. I often go to networking events with people NOT involved in social media, and perhaps do not even use the Internet much, but it doesn't mean they don't want to learn more about it! 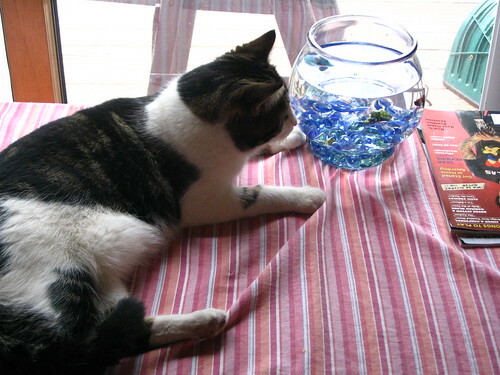 I totally agree with your observation that we're in different fishbowls within the same large tank. Mandy and Holly do have a different circle of connections than the PCPGH core and I'm glad they are stepping up to reach out to the community at large. Because of their outreach, I have noticed an addition of new followers and connections across the board for me, and fellow PCPGH people. That being said, organizing TweetUps and small scale events will continue to foster these networking opportunities for the future. I think I knew about Twestival for about 2 weeks. I saw numerous mentions on Twitter and also on our Cleveland Social Media Club site. At Cleveland's Twestival I met several people who weren't already involved in our Cleveland SMC group so that was good. The word had spread. But as in Pittsburgh many said they had only just heard about it. I think you are right that we get used to our own little worlds. Yet all it takes is making contact with one or 2 from another circle to find that those circles have things in common and should connect. To encourage wider idea sharing and even project collaboration we just need to find the people who make up the nexus points between circles. Well...The twestival was in my backyard (almost literally). I knew as well but never followed up. Fail on my end big time. But, let me not miss the opportunity to point out a great blogging for-"marketing, rank, visibility", this could have made a big enough stink that everyone would have known. I guess their are not enough hours in a day to complete your duties to yourself and to your passion(great pro-cloning plug). In the future the five families ( podcamp, devhouse, pghbloggers, alpha lab,geeks)should come together and decide a city wide social media oriented (not all cocktail mixers= social media event).Provide access for those involve d's "godfathers" to upload current events as they come up. This should be a common practice already for many coordinating groups to do PR just add the "PGH social media hub" to the list of media contacts. Easy right? Time...Time..Time...Who?How?What? Did I mention this was just an opportunity for me to point out why we should not overlook blogging for rank, marketing and visibility? My life passion involves communication, creation and empowerment, which for the majority of these past 8 yrs has been via yoga and podcasting. I have to teach everyday folks, those NOT in social media (other than FB), what podcasting is, how to subscribe to blogs, what twitter is, etc. The folks that I reach out to to participate in social media call to action meet-ups I do individually (via email or face to face). Yes, it's time consuming, and at times frustrating, but I find that, in this level of engagement the result is always much more than 'tweeting' or 'blogging' about it, plus you get the added bonus of educating more and more folks about the incredible power of social media and its ability to form powerful communities. I'm so very bummed I didn't get a chance to hang out at the Twestival and meet folks, but I'm sure I will in the future! I did know about the Twestival, and had initially planned to go. But there are so many tweetups and meetups and BlogFests and Open Coffees this month, I felt I would have to miss a few. I can't miss the one I planned, so the Tewstival was the one that fell off the plate. And being a bit too busy on the whole, I didn't take the time to post about the event either. I'm definitely not suggesting that people should plan fewer events. I mean only to point out that the more events we plan, the more we'll need to recognize that people will continue to be pulled in more and more directions. I just saw this blog post and I know that Justin and I have spoken about this before. I thought I would put my two cents in since my name is on here. I personally don't think I fall into any social circle. We saw a need to start a tweetup group last year, I created a ning page and we have tried to grow that group little by little. Each month we have an event and hope that new people join the fun. It's been great that others have also added their own events to that ning page so that we can continue to build our community. I feel like our ning page is a great spot to get the word out for any event whether Mandy or I put it together or someone like Jeffrey from the Mattress Factory. With a city this size I'm kinda surprised we're having issues with clicks like back in high school but now in our social media world. We all share the love for technology, conversation and new ideas. I would think that would bind us together. We recently created @PGHTweetup twitter account and we've been pushing out any event whether it's PCPGH, Pittsburgh Bloggers, etc. Maybe Justin, Cynthia Closkey, Woycheck, Mandy and myself need to hook up and figure out how we can solve some of these barriers that we're seeing. I'm totally game to make the communication better and to help grow our community. PGHTweetup is one good way to bridge the gap among groups. But any method(s) we use to circulate information more widely will also require promotional time as well, to raise awareness of these information hubs themselves. And THAT promotional time has to be balanced against the individual needs of the events we're all working on in the first place. Social media; better with coffee. I created and produce a web sitcom called Something to Be Desired, among other things. I'm a social media explorer. What Makes a Social Media Expert? Who Starts a Company During Economic Collapse?